iPad Home Button Not Working? Here's What To Do! You are at:Home»iPhone»Repair»iPad Home Button Not Working? Here’s What To Do! Your iPad Home button is stuck and you’re not sure what to do. No matter how many times you try to press it, nothing happens. In this article, I’ll explain what to do when your iPad Home button is not working and explain how you can get it repaired today! Is My iPad Broken? Does It Need To Be Repaired? Even though your iPad Home button is not working, it’s possible that there isn’t a hardware problem at all! When you press a button on your iPad, it’s the software that tells your iPad to perform the task. Your iPad may just be experiencing a minor software glitch! Apple has built in a temporary solution when your iPad Home button is stuck or simply won’t work — it’s called AssistiveTouch. When AssistiveTouch is on, a virtual button will appear on your iPad’s display. This button allows you to lock your iPad, turn off on your iPad, and so much more. To turn on AssistiveTouch on your iPad, go to Settings -> General -> Accessibility -> AssistiveTouch. Then, turn on the switch next to AssistiveTouch. As soon as you do, a small button will appear on your iPad’s display. When the AssistiveTouch appears on the screen, you can use your finger to drag it around the display. To use the button, simply tap on! Although it’s unlikely, it’s possible your iPad Home button is not working because the case on your iPad is preventing you from pressing it all the way down. Try taking off your iPad’s case and pressing the Home button again. If it still won’t work, move onto the next step! Can You Still Press The Home Button, Or Is It Totally Stuck? You can’t press it down because it’s completely stuck. You can press it down, but nothing happens. If scenario one describes your iPad, then your only option may be to repair it. Dirt, gunk, and other debris can occasionally get stuck in your iPad’s Home button. Try wiping it down with a microfiber cloth to see if you can clean anything out. You probably won’t have much success with this because there isn’t really an easy way to clean it out without opening up your iPad. If you want to get your iPad Home button fixed, scroll down to the “Repair Your iPad” section of this article. If your iPad Home button isn’t stuck, there’s a chance the software is causing the problem. Work through the troubleshooting steps below to try and fix the problem! 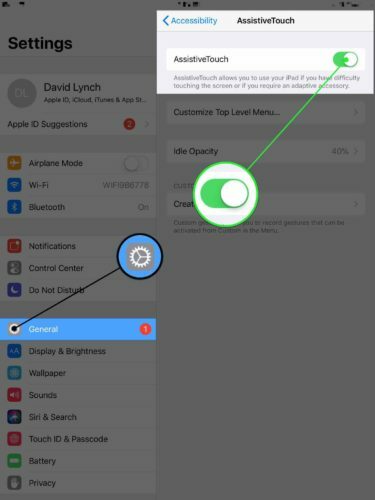 The first software troubleshooting step when your iPad home button won’t work is to simply turn it off and back on. This can fix a minor software glitch that could be causing the problem. Press and hold the power button, then swipe the red power icon when “slide to power off” appears. Wait a few seconds, then press and hold the power button again until the Apple logo appears. Before we move onto the restore step, I first recommend backing up your iPad. That way, when you actually perform the restore, you’ll be able to quickly restore from the backup and not lose any of your data or information. To backup your iPad, plug it into your computer and open iTunes. 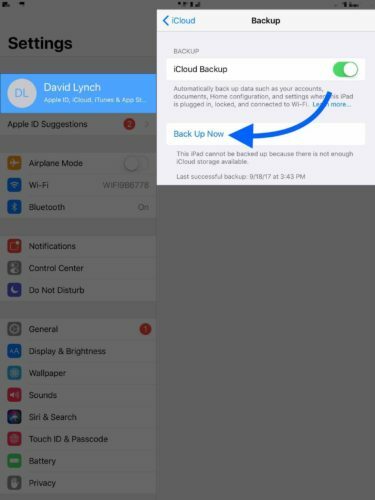 You can also go to Settings -> Your Name -> iCloud -> iCloud Backup -> Back Up Now. Now that your iPad has been backed up, it’s time to put in DFU mode and restore. There’s only one problem — the Home button is broken! Without a working Home button, you can’t restore your iPad the conventional way. Instead, you’ll have to use special software to perform the restore. We recommend Tenorshare 4uKey, which we’ve personally tested and reviewed. We can’t guarantee that a DFU restore will fix your iPad’s Home button because it could still be not working due to a hardware issue. You may just want to have the Home button repaired rather than paying for a third-party software that may not even fix the problem. The final step of this article discusses your two best repair options, both of which will help you fix your iPad! If you’ve made it through all the troubleshooting steps and your iPad Home button still isn’t working, it’s time to explore your repair options. If you have AppleCare+, set up an appointment at your local Apple Store and bring your iPad in. However, if your iPad Home button stopped working after it got wet, the Apple Store won’t be able to help you out. AppleCare+ doesn’t cover liquid damage, so the best they’ll be able to do is completely replace your iPad, which won’t be cheap. We also recommend a repair company called Puls. They’ll send a vetted technician directly to you in as little as 60 minutes. Puls techs can repair your iPad’s Home button and help fix water damage issues, if that’s the root cause of your iPad Home button problem. You’ve successfully fixed your iPad’s Home button, or you have a great option to get it repaired if necessary. Next time your iPad Home button is not working, you’ll know exactly what to do. If you have any other questions about your iPad, leave them in the comments section below. Previous ArticleiPad Stuck On The Apple Logo? Here’s The Real Fix! Next Article iPad Power Button Stuck Or Not Working? Here’s The Real Fix!